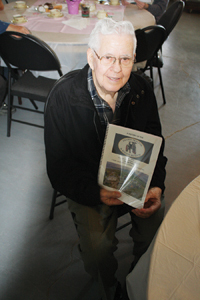 A few years ago a history book was completed to commemorate the 30th anniversary of the Prairie Tractor and Engine Museum, located just outside of Picture Butte. Now, the book helps celebrate the local society being 35 years old. “It could be updated, I suppose,” said Jim George , prior to an afternoon tea to celebrate the museum turning 35. He compiled the information for the history book. The book, tells the tale from the very beginning of the Prairie Tractor and Engine Museum. “From 1982 and how they started out between Dunn’s Farm. It was there for four years with the threshing show and then moved into here when they bought this property. The property was originally very small, less than five acres then they gradually acquired more so they had a place to grow some crop,” he noted. George said the museum rented the land and then bought it. “They drew up a plan early for the village and only part of that has been realized. The design shows a grain elevator and a model farm, which never materialized. They did get a line on a grain elevator once and found it was too expensive to move it. It cost about $45,000 to move it and they talked themselves out of that,” he joked. An interesting part of the history is the coal mine, he added. “The ravine that runs around here and eventually empties into the river was the location of about four or five different coal mines,” he said. One of the original reasons for the museum was for an annual threshing show, which has always run the second Saturday in August. “They set up an old threshing machine and they cut some of the crop with a binder, bind it and then haul it in on a rack and put it through the separator. Not a lot of it, just enough to illustrate how the machine works because the crop is saleable,” he explained, adding there used to be pony races, a heavy horse pull, sheep shearing and a tractor pull too. According to George, the book features numerous tractors that have been restored by the museum over the years. “A tractor would be donated or two of the same kind and one would be stripped for parts to build the other,” he said. There’s a chapter on the acquisition of buildings, he added. “The shop was the first build because they wanted a place to do their restoring work inside. It served as a meeting place, a banquet room and a workshop for quite a number of years until the Kleeman Hall was built and became the banquet hall, the dance hall and meeting room and the centre really of the museum,” he said. George said the museum wanted to showcase what it was like to live back in the day and the history book preserves the area’s history. Visit Coyote Flats Pioneer Village and pick up a copy of the book.